In the twenty-first century we are accustomed to the idea that many products, as distinct from brands, have very short life cycles. Take for example the car shown right in the photograph. It is a BMW (the “parent” brand) 3-Series (the “sub-brand”) from around 1975. If we compare this vehicle with the latest version of the same brand, shown on the left, about the only point of recognition is the BMW logo on the bonnet. We find nothing unusual or exceptional about the evolution of a product over thirty years with that product retaining, over all of this time, exactly the same brand descriptor. There have been five different versions of the BMW 3-Series since 1975 each of which was an evolutionary leap forward from its predecessor but all of which have been aimed at precisely the same target market – the successful professional who wants a combination of performance, comfort and prestige. The product life-cycle is about six years – the brand life-cycle much, much longer than that. Each successive iteration of the 3-Series brand offered the consumer new benefits - both practical and emotional - it is never enough just to update the features of a brand, the styling for example. What BMW offer every six years or so are benefit enhancements which give the consumer more – the cars become safer, more economical and easier to drive as well as conferring more self-esteem on the buyer from their appearance and their novelty. petrol stations across many national networks. But whilst the timescale may be very different from durables and FMCG brands the principles are the same. If a brand radically changes the appearance of its networks these changes must be consumer driven and provide the motorist with real benefits. I was the global project manager for Shell’s new “Retail Visual Identity” (RVI) project in the early 1990s – the scale was enormous with more than 40,000 petrol stations in over 120 countries. 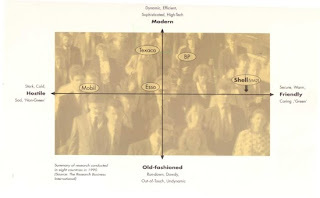 Research around the world told us that Shell’s image was becoming dated compared with our main competitors (see brand map) – but also that we had, at that time anyway, an enviably high rating on the “hostile/friendly” axis. BP had recently updated their networks with a new image that was a step change from every other design in the market – and it was working. The time was right for Shell to change as well. Crucial to the design brief, its development and its execution was to ensure not only that the new design offered real consumer benefits but that it was as far as possible “future proofed”. No brand, least of all a major oil company brand, wants to go through a billion dollar re-imaging campaign too frequently! In fact the new identity endured well and it is still at the heart of Shell’s offer to the customer – the recent changes that have been made to the original design have been evolutionary and have built on that major change that we introduced back in the 1990s. But whilst that original new design solution worked, taking Shell towards the “modern” end of the “modern/traditional” axis on the brand map without foregoing any of the “friendly” characteristics, the changes were not cosmetic. Every element of the redesign, from the improved lighting and signage to the ergonomics of the pump island, was consumer driven and based on research. In the popular press the change of a brand’s logo, symbol or emblem can often be headline news – usually accompanied by a “shock horror” story about the cost – especially how much the designer was paid! 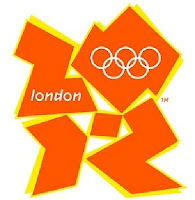 When, a few years ago now, the symbol for the London Olympics was announced it caused a furore – and rightly so. The furore was justified not just because the logo was demonstrably unfit for purpose but because investigations revealed that there had been no proper quantitative research into it - and no comparative consumer research (comparing one design with alternatives) either. This was a major error because research not only helps you get the right outcome in such a project but statistically significant results are a neat way of disarming tabloid press critics! When BP changed their symbol from the latest version of their traditional shield (introduced in 1989) to a new abstract design in 2001 it was not universally welcomed - but there was no doubt that BP had done their homework, that behind the logo change there was a clear strategy and that a major change was competitively necessary. Sometimes logos evolve very gradually over time – the Shell emblem is a classic example of this. Sometimes, however, as was the case for BP, a much more dramatic change is necessary – and the only way to find out what to do is to carry out rigorous consumer research and to be clear about your strategic brand objectives. A mistake could be very costly indeed! The American business guru Dan Pink recently said that “…the most important thing in design is empathy: the ability to understand some thing from the other person’s perspective”. He also said “…we have to meet a new emphasis on improving experiences instead of objects, and we need to improve the flow of interactions between customers and service providers.” Anyone involved in managing brand change over time, especially in the service sector, would be well advised to think about Mr Pink’s words. We are quite used to the idea that consumer durables improve all the time and that the life cycle of a product/brand like Apple’s iPod is measured in months rather than years. I recently asked a senior marketer from one of the big mobile phone companies how long the cycle was for his products and he said “…around four months”. He did not say that all of the implied changes were purely consumer driven – technological advances and the need to respond to competitors’ innovations are obviously also crucial. But he did say, as Mr Pink would no doubt hope, that it was the customer’s perspectives – his/her needs and wants – which are at the heart of the process. So the simple answer to the question as to when brands should change and whether such change should be revolutionary or evolutionary is to listen to what our customers tell us – and hopefully they will tell us before they leave us and go to the competition! Shell, in the example I have given, was a tad reactive – it was BP’s changes which were the original stimulus rather than initially the analysis of research. Today it seems to me that the petroleum sector is crying out again for a renewed “emphasis on improving experiences” as Dan Pink calls it. There are some positive signs – such as BP’s “Wild Bean Café” – a response to the Starbucks/Costa Coffee/Caffè Nero coffee shop revolution. This is a rare serious attempt by an oil company to create its own proprietary in-house food/refreshment brand. 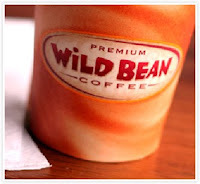 It is the kind of “out of the box” thinking that Wild Bean Café represents which can rejuvenate brands by improving the customer experience. Above all marketers, and especially oil companies, need to spend less time examining balance sheets and P&L accounts and much more time listening to customers and trying to meet their needs. If they do this, and innovate in design terms at the same time providing valued benefits to meet identified customer needs, then their brands will prosper – and the bottom line will take care of itself!